For the best part of the decade one of the most popular smartphones in the US was the T-Mobile Sidekick range. A versatile and easy-to-use platform, the Sidekick appealed especially to younger users… but it also turned out to be a great messaging device for hearing-impaired customers too. 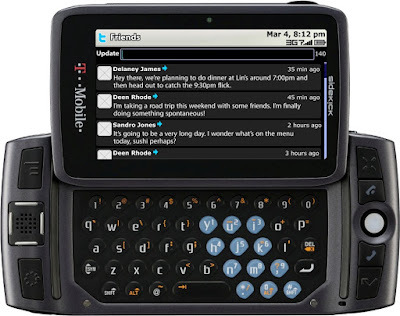 The Sidekick was actually a T-Mobile branded Danger Hiptop device. Originally launched in 2002, the platform evolved over the years to become the catchily-named T-Mobile Sidekick LX 2009. Like most other Sidekicks, this had a decently-sized display that slid back to reveal a relatively large QWERTY keyboard underneath. The LX 2009 was the first one in the range with 3G support and GPS, on top of which it had Bluetooth and a 3.2 megapixel camera. But what the Sidekick really excelled at was apps, in particular messaging. If combined with a data-only plan, it was possible for users to keep in touch with their friends either through the built-in messaging app or the integrated social networking support. This also appealed to deaf users because of its convenience, ease-of-use and relatively low cost. All data was backed up to what we would call a “cloud” today, so it didn’t matter if you lost your device… you could simply get another one. The Sidekick wasn’t just limited to the US, T-Mobile carried it in other countries too and other carriers branded variants of the Danger Hiptop devices with their own names. But the US was the biggest market, and T-Mobile was the exclusive carrier there. It looked like the Sidekick had carved out an important market niche, and even upcoming smartphones such as the iPhone and Androids didn’t really look like they compete with what the Sidekick excelled at. But there was trouble brewing. In 2008, Danger was bought by Microsoft who then promptly started to leach people and resources out of the company to work on Microsoft’s own projects. A catastrophic failure of Danger’s own servers in late 2009 led to an embarrassing data loss which it took months to recover from, and even then it didn’t get back everything. It was a devastating blow for T-Mobile Sidekick brand. T-Mobile dropped the Sidekick platform in 2010, and although it laboured on with different carriers for a while, by 2011 the service was discontinued completely. And what did Microsoft do with all the employees they took from Danger? They developed the Microsoft KIN, which turned into one of the biggest handset disasters of all time. Two catastrophes for the price of one. In mid-2011, T-Mobile tried to revive the Sidekick concept with a Samsung-designed Android phone. Although it was a decent facsimile of what a Sidekick could be, T-Mobile were really trying to flog a dead horse and it was not a success. Today there are quite a few Sidekicks about on the second-hand market, mostly from the US. Because Danger’s cloud service shut down long ago, they are not really very useful for much except as an example of what might have been had Danger not messed up.